Huichol Indians may have retained many of their ancestral traditions, such as shamans and their annual cycle of ceremonies, but Huichol culture has changed significantly in the past three hundred years. During colonial times, the Huichol adopted string instruments, the use of metal tools, and the keeping of animals such as sheep, horses and cattle. They also accepted some aspects of Catholic religion. Beginning in the 1950s, government programs financed the first airstrips in the region. Government agencies have since improved roads, opened clinics and constructed schools for basic education and trades. The government’s efforts have included agricultural aid stations, the drilling of wells, and support for the introduction of more modern agricultural techniques and equipment, such as barbed wire and tractors. Other programs have focused on providing alternative sources of revenue such as beekeeping. All these changes have come at a price. The ancestors of the Huichol practiced a nomadic lifestyle over a large expanse of land in order to acquire the resources they needed for survival. When the Huichol were pushed back into the mountains,they adapted by undertaking an annual migration to gather their sacred peyote. At the same time, they became increasingly dependent on the cultivation of corn. However, in such marginal areas where rainfall is unreliable the corn harvest is never guaranteed and in bad years starvation is a real possibility. Closer links to the outside world have meant that the Huichol can now buy cheap, bottled alcohol, and face increased pressure from outsiders who want more grazing land, timber and minerals. They have also led to the out-migration of many Huichol, whether permanently to nearby cities or seasonally to work on tobacco plantations in Nayarit. 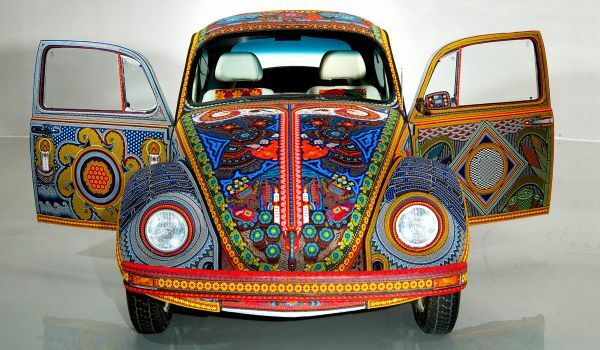 In the past fifty years, this has led to some innovations in Huichol art, including the addition of large yarn paintings and larger items decorated with complex bead work (see image) to their traditional arts and crafts. Even though the Huichol are one of the most isolated (not just geographically but also economically and socially) indigenous groups in Mexico, there is nothing static about their culture. It will be interesting to see what changes the future brings. Barrin, Kathleed (ed) Art of the Huichol Indians. The Fine Arts Museums of San Francisco, 1978. Mata Torres, Ramón. La Vida de los Huicholes. Tomo I. 1980. Guadalajara, Jalisco. Mata Torres, Ramón. El Arte de los Huicholes. Tomo II. 1980. Guadalajara, Jalisco.